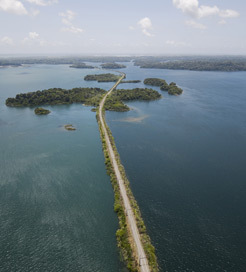 Panama is situated on the isthmus connecting Central and South America, with the Caribbean Sea to the north and the Pacific to the south. Famous for its 48-mile long canal, Panama also offers a vibrant culture, diverse wildlife and beautiful scenery which attracts a growing number of visitors each year. The indigenous meaning for Panama is ‘abundance of fish’, which gives a clue to its impressive biodiversity. It is home to over 900 bird, 218 mammal and 226 reptile species as well as 125 animal species found nowhere else in the world. The national marine park in Veraguas Province offers fantastic opportunities to spot dolphins and killer whales too. The capital, Panama City is a bustling metropolis drawing architectural influences from Miami. It is a refreshingly dynamic city, boasting historic ruins, towering skyscrapers, the world-renowned canal and multiple access routes to the rainforests. In the forests, you can enjoy adrenaline-fuelled activities such as zip-lining and river rafting, alongside more relaxed outings like guided bird watching and coffee sampling. Panama produces some of the finest and most expensive coffee in the world thanks to its ideal tropical climate, high altitude and volcanic soil. As you would expect from a slender country like Panama, there are plenty of long, exquisite beaches to choose from. One of the best can be found in Bocas del Toro on Isla Colon, a haven for party-seeking backpackers. On the Pacific coast lies Boca Chica, the gateway to the Gulf of Chiriqui National Marine Park, featuring hundreds of beautiful islets with pristine beaches. There are ferry crossings provided a few times each week between the Pearl Islands of Contadora, Saboga and Viveros in the Gulf of Panama and Panama City.